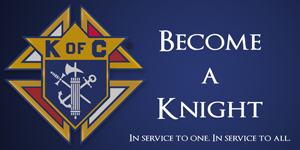 Interested in becoming a member of the Knights of Columbus? Please provide us your contact information. The Knights of Columbus is the world&apos;s largest Catholic fraternal organization. Founded on the principles of Charity, Unity, Fraternity and Patriotism, the Knights serve the church and community through acts of charity and service. Council 12929 is always looking for new members to join our ranks. If you are interested please reach out to one of our members. Council meetings are held the first Thursday of every month in the parish hall.